Let me start by defining “in the yard”. The majority of the time, that truly does mean present within the physical boundaries of my yard as established on maps and all sorts of legal documentation. However, I will still incorporate birds seen from the yard with that same grouping, for the purposes of tracking in my obsessive list-keeping. It was either that, or start a whole other list. I have enough lists. I snap a lot of pictures in my yard. A lot of pictures. It is the birding space I am most familiar with, both in terms of the layout of the area, and the most common visitors and their behavior. Familiarity with my equipment – my camera, the occasional tripod (I mostly shoot freehand, as I do not care for carrying a tripod around with me when hiking), and a couple of filters (usually I have a polarizing filter on the lens when outdoors) – is hugely important. Being able to bird in my yard, from my living room window no less, affords me the ability to take my time a bit more and also to not have to worry about common elements like rain and wind. A lot of these pictures never are shared, as they are more practice and experimentation than anything else. Sometimes, however, I get lucky and come up with an unusual visitor or a particularly good shot. This post is a blend of both plus a bit of rambling. Early in December, I caught a flash of fast-moving feathers above the treeline. 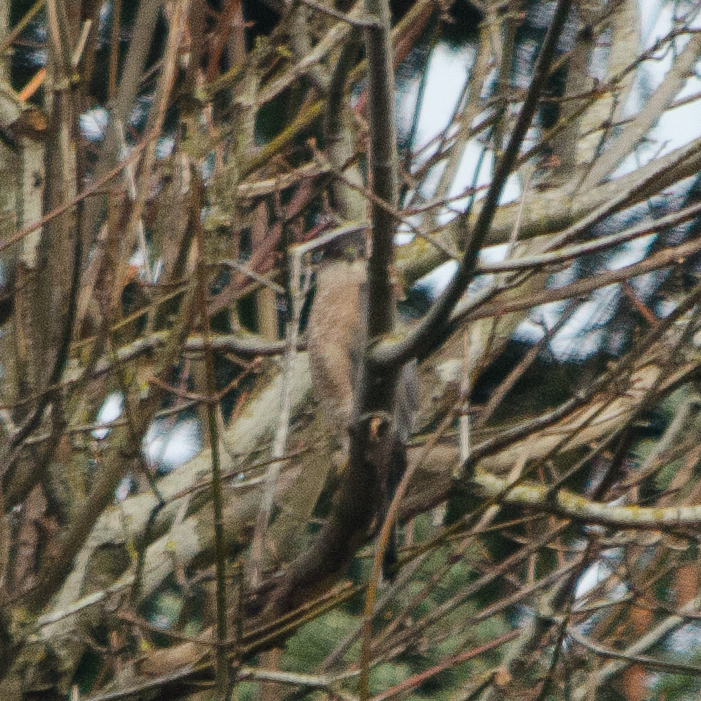 The bird had to be a hawk; it’s not uncommon for birds of prey to go by overhead, but this one landed in a tree visible from the yard. I immediately grabbed my camera and snagged a few shots. 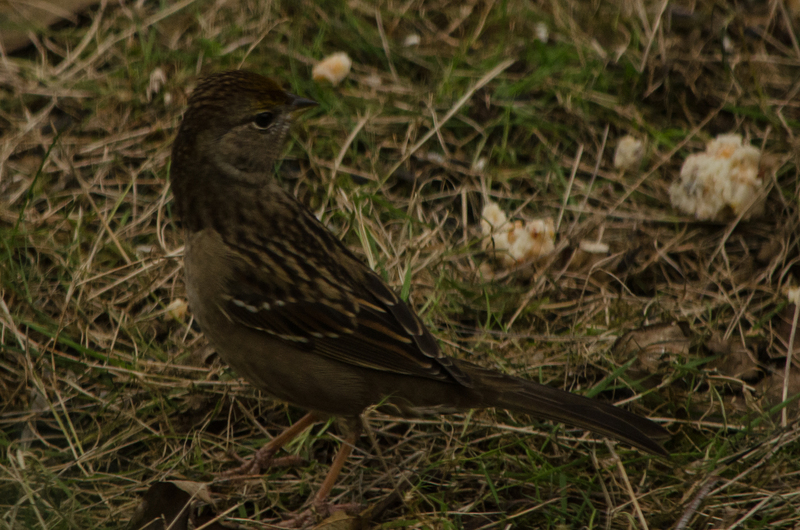 The bird was at the limits of what I would even attempt to photograph, and not in a very good position. He stayed for over 30 minutes before taking off, and it took quite a bit of studying the pictures for me to be comfortable claiming the identification as a Cooper’s Hawk and adding this bird to my list as number 123 for the year. Cooper’s hawk and sharp-shinned hawk are very similar, but there are some key identifiers that leave me confident on this one. This was clearly an adult, based on the blue-gray coloration on the wings; juveniles of both species are brown. 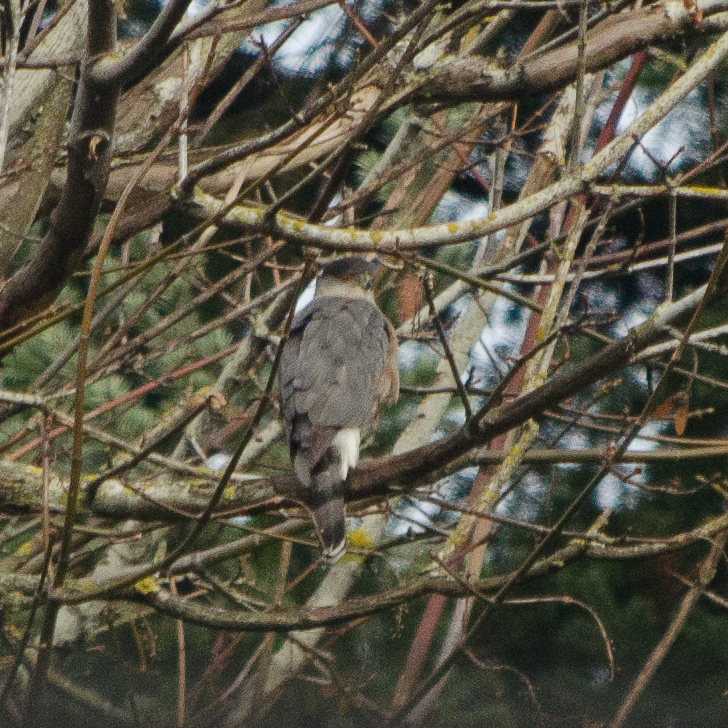 (I spotted a juvenile sharp-shinned hawk earlier this year in Oaks Bottom.) The Cooper’s hawk has a more consistent body size, where sharp-shinned hawks are more top-heavy, or barrel-chested; their tails are more rounded with a thicker white strip at the bottom, where a sharp-shinned is more squared off. The eyes on Cooper’s hawk are closer together, whereas sharp-shinned has a wide-set gaze; this was harder to judge from a distance and with the angles I have. The crown on both birds is dark, but on the Cooper’s hawk this creates a more defined cap, whereas on the sharp-shinned the dark coloration extends down the neck to give a cowled-look. In regards to behavior, I was very surprised this bird sat still for as long as it did. It was not preening, and the weather was fairly mild if overcast; it was content to just sit and look around. Doing a bit of research, Cooper’s hawks tend to keep their heads in constant motion and that certainly held true for this bird. Although the bird only changed perches once, it never ceased moving its head around, looking in all directions. Over a couple weeks of birding in the yard, I caught a few of my more regular visitors around the feeders.Varied thrushes first made an appearance in my yard during a snowstorm last winter, and I was glad to see them return this year. Although they can be a bit of a feeder bully, the are very bright additions to the yard and also seasonal (they tend to go back to higher elevations in the spring). This fellow is the male; I didn’t see a female with him this time, but as is common in the bird world, her coloration is less pronounced. 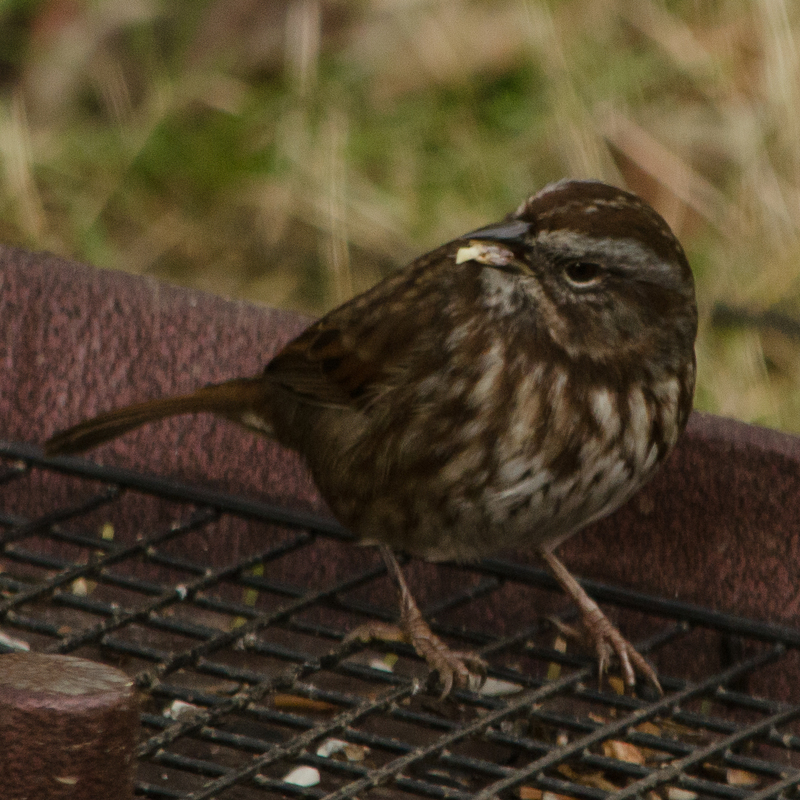 I have a couple of regular song sparrows that visit my yard year-round. They remain skittish around people, which is actually fine by me as it is probably safer for them, and they rarely come out from under cover long enough for me to get truly good pictures. About the only time I can snag them in good light is when their mouths are full. 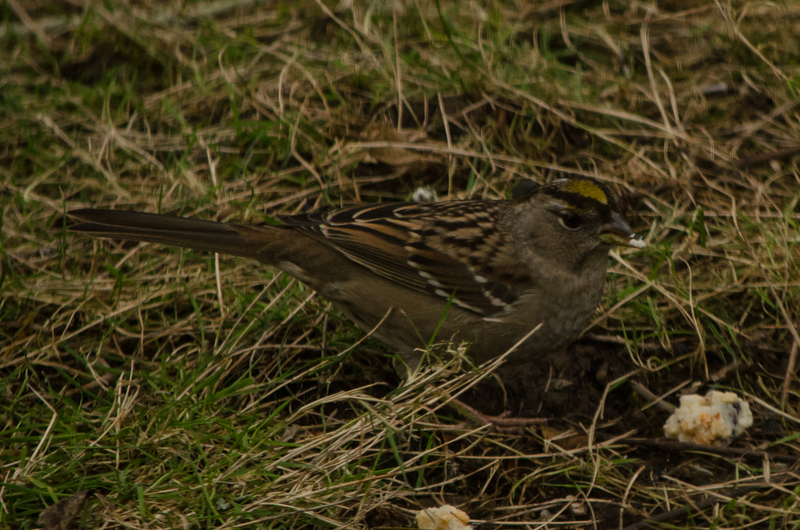 In the late fall and through winter, I can almost always find some golden-crowned sparrows in my yard. 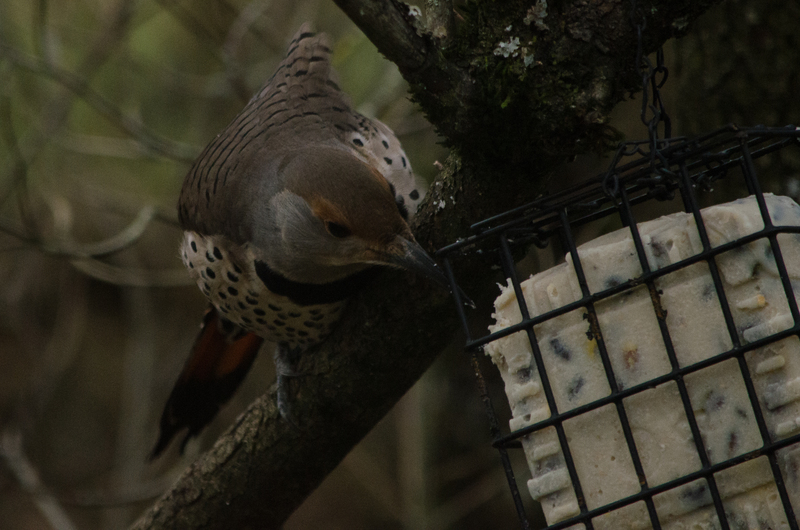 I was trying out some suet crumbles for the first time, and they seemed to be fans of the stuff. All last winter, I had a female Anna’s hummingbird claiming my yard; I would like to think this is the same girl, but I cannot be certain. I’ve seen her a few times in the last couple of weeks, though. 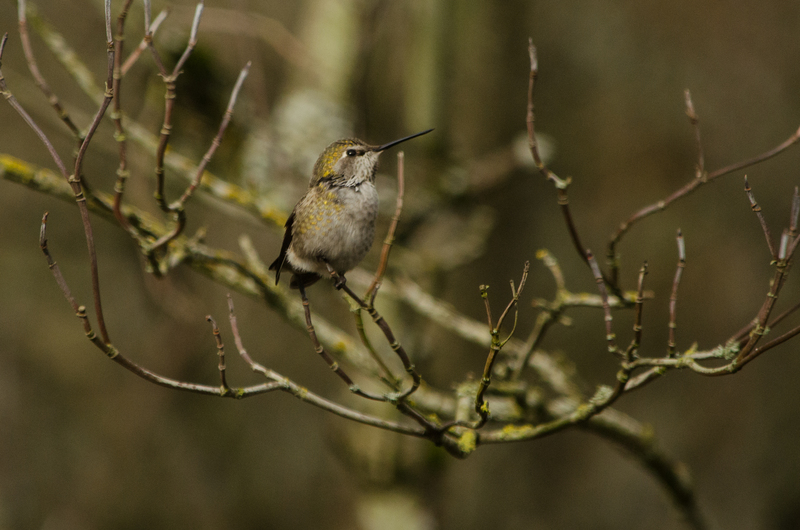 I do not think I will ever tire of taking photos of hummingbirds. Depending on the image, they can appear delicate or warrior-like. 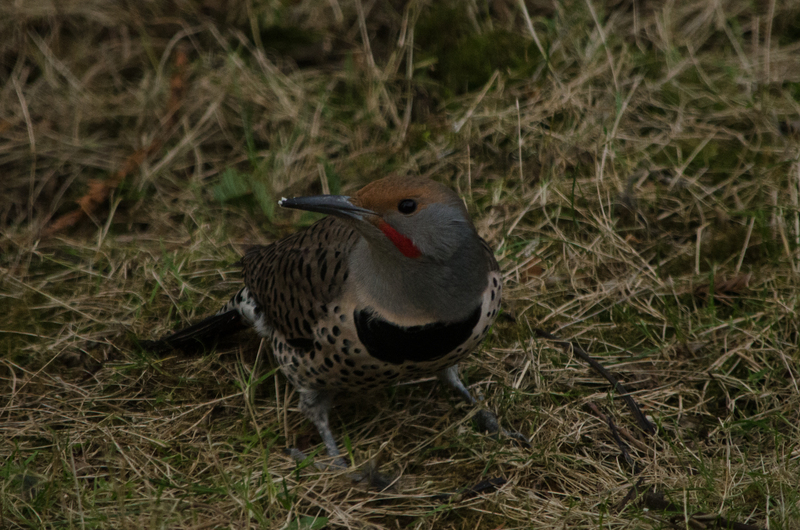 A pair of red-shafted northern flickers, who are huge fans of suet, come by very regularly. The male has a bright red ‘mustache’, and more of a rusty color about the face than the female. Both have bright red-orange feathers under the wings and tail which are typically only visible in flight. 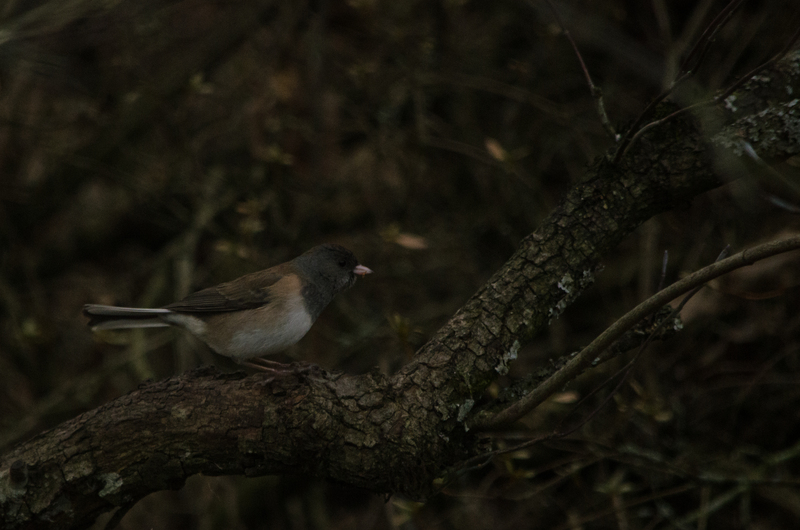 Last but not least are the little dark-eyed Juncos, of the Oregon variety. There are several colorations included in the dark-eyed junco species. The Oregon type has a dark head, black on the males and brown on the females or immature males, a pale beak, pinkish legs, a red or rusty side, pale belly, and brown back. The outer tail feathers are a distinguishing white, visible both in flight and while perched at times. These birds are often found in flocks of varying sizes. This one looks to be a winter male. For more images from my birding both in the yard as well as out and about, be sure to visit my Flickr site. Comments are always welcome! All beautiful! How wonderful for you that the Coopers decided to stop by. 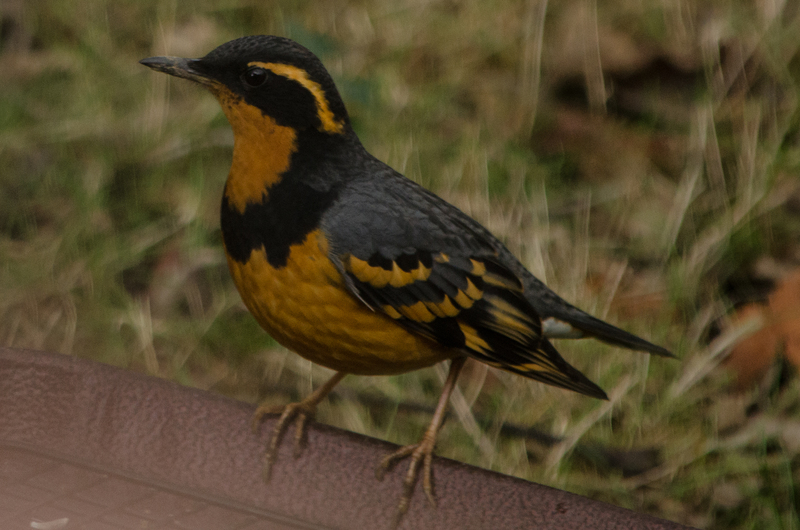 I have never seen a Varied Thrush; maybe one day. I have two who have started coming by more regularly, they are a bit of a bully around the feeders but stunning to see. As am I! I really missed the Pine Siskins last winter, I had hardly any at all, so I am hoping they return this year. That was my yard year before last – I had 20+ several times, but only two last year. So far for me this year, my heavy visitors are starting out as chestnut-backed chickadees, with a couple of golden crowned sparrows. With migrations slowing down, I am curious to see who stays around and who moves on.